The Texas Medical Board has finally gotten around to taking action. 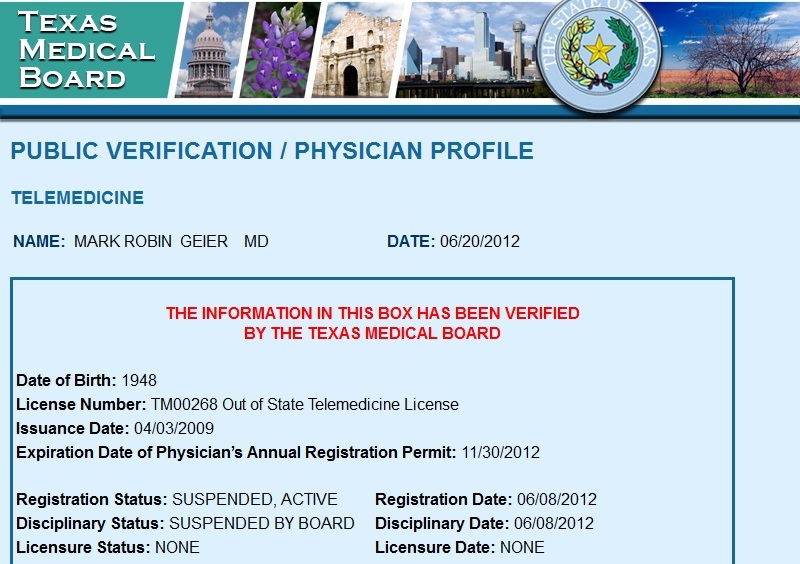 On June 8, 2012, they suspended his license to practice medicine in the Lone Star state. This situation is a little bit different from previous suspensions, though. When his licenses were suspended in California, Indiana, Kentucky, Maryland, New Jersey, Virginia and Washington, the respective medical boards acted without Dr. Geier's feedback or agreement to the suspensions (though he was given the opportunity to appeal the Maryland board's decision). Texas, however, seems to have had some level of discussion with him, to the point that he actually agreed to let the Texas board suspend his license without contest. Further, he agreed to abide by any further action that the board might take, such as revoking his license in the event that the Maryland board revokes his license there. The only actions open to Dr. Geier are to petition, in writing, to have the suspension stayed or lifted, but that must be accompanied by "clear and convincing evidence and information" that he is "physically, mentally, and otherwise competent to safely practice medicine". Even then, the board may, at its discretion, deny the petition without further appeal or review. Dr. Geier must cooperate fully with the board; any violation of the terms of the order would be grounds for further punitive actions against him. My impression is that he may be trying to mitigate the damage to his character that he has already wrought himself. By cooperating with the Texas Medical Board, Dr. Geier might appear to be rehabilitated, and these actions could be presented in his favor in any further appeals or petitions he may attempt in Maryland or in other states. It may also be a way to prevent his remaining license in Hawaii, Illinois and Missouri from being suspended. Of course, this is merely speculation, and we can only know what impact, if any, it will have once events have played out further. In the meantime, I have updated my map showing the states in which Dr. Geier has (or had) licenses to practice medicine. I have read a few of these but don't comment often. Kind of sad that the Geier is still licensed in Missouri. I wonder why? Could another reason he isn't fighting so hard is he has discovered that the "biomed" people treat autism actually are even more devoted to them when they are "victimized" by the evil AMA, big Pharma, etc.? Just another thought. The one email account I used to post on AofA with was permanently banned within 24 hours of my first posts. I was disappointed - I was polite and kind; just didn't agree with them. Why is a dissenting opinion so dangerous? I know the reason he's still licensed in IL is that Maryland hasn't (yet) completely revoked his license. Disciplinary action of another state or jurisdiction against a license or other authorization to practice as a medical doctor, doctor of osteopathy, doctor of osteopathic medicine or doctor of chiropractic, a certified copy of the record of the action taken by the other state or jurisdiction being prima facie evidence thereof. Failure to report to the Department any adverse final action taken against them by another licensing jurisdiction (any other state or any territory of the United States or any foreign state or country), by any peer review body, by any health care institution, by any professional society or association related to practice under this Act, by any governmental agency, by any law enforcement agency, or by any court for acts or conduct similar to acts or conduct which would constitute grounds for action as defined in this Section. 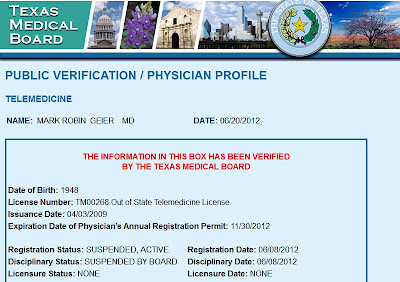 Failure to report to the Department surrender of a license or authorization to practice as a medical doctor, a doctor of osteopathy, a doctor of osteopathic medicine, or doctor of chiropractic in another state or jurisdiction, or surrender of membership on any medical staff or in any medical or professional association or society, while under disciplinary investigation by any of those authorities or bodies, for acts or conduct similar to acts or conduct which would constitute grounds for action as defined in this Section. These are just the parts of the law that speak to disciplinary actions in other states and, by themselves, are enough for the Illinois Medical Board to take action against him. Whether they are aware of the actions taken by all those other states is another matter, entirely.